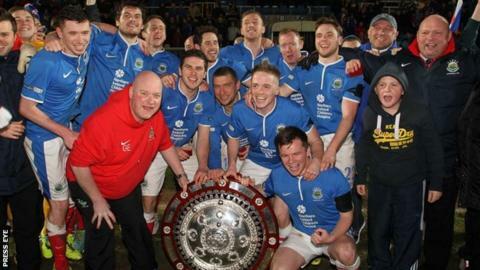 Linfield will begin their defence of the County Antrim Shield against Championship One outfit Dundela at Windsor Park on Wednesday night. The Blues beat Crusaders in a penalty shoot-out to secure the trophy in last season's delayed final in March. Warren Feeney's side will be keen to progress after falling to Ballyclare Comrades in the League Cup last month. With league matches to follow on Saturday and Monday, Feeney will rotate his squad for the Shield encounter. "Some of our players are chomping at the bit, so it's a good chance for them to show what they can do on Wednesday," said the former Northern Ireland international striker. Cliftonville have already made the Shield quarter-finals by defeating Ballyclare 5-2 at Dixon Park last week. Four first round ties will be staged on Tuesday 23 September, with Glentoran playing Larne, Ballymena United travelling to Donegal Celtic, Bangor hosting Glebe Rangers and Newington YC playing Immaculata. Wednesday night's other fixture sees Ards face Ballymoney United. Crusaders received a bye into the next round after their opponents, Carrick Rangers, withdrew from the competition as they were unable to fulfil the fixture because they will not have floodlight facilities available this season.